The best wood floor artisans seem to always be thinking about wood floors, and they will tell you they get design inspirations from varied and sometimes unlikely sources. This floor is no different—it struck Schenck and Company owner Greg Schenck years ago when he noticed the ceiling while having an adult beverage. “I was sitting in a bar at the Gage Hotel in far west Texas, and I thought, ‘Man, that would be a really cool floor, but it would have to be a special wood, not just any wood,’” he recalls. The ceiling Schenck was considering was a design typical in Southwest construction called “vigas and latillas,” with exposed beams and narrow timbers. A long time passed before Schenck was struck again by a related idea. Driving by one of the many pallet yards common to Houston’s shipping industry, he thought about the piles of old pallets. “I thought, why couldn’t you do a floor from old shipping pallets? 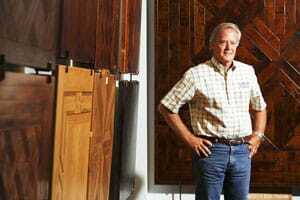 Everybody’s interested in the newer ones, not the older or broken ones.” Schenck ended up making a sample for his showroom, and he’s now sold the floor twice—to the same customer. She had it installed in her Houston home, and about 10 years later, when she was building a new home on a ranch, she wanted the exact same floor. The company bought truckloads of pallets, denailed them, disassembled them and searched for the right mix of hardwoods and softwoods, since “anything goes” for making pallets—any width, any thickness and any species. The boards were fumigated, and, to preserve the weathered face of the boards, they were planed from the back to get a more consistent thickness. The sharp cuts on the board were then distressed. On-site they were glued to a plywood subfloor over the slab and face-pinned with headless pins. The floor was “smoothed”—with an old screen or a nylon pad, just enough to get any roughness off—and penetrating oil sealer was burnished into the floor.